More football, more injuries. The regular season has come to an end, meaning all but 12 teams can head for a warm, sandy beach and a couple months of downtime before the offseason program gets going. 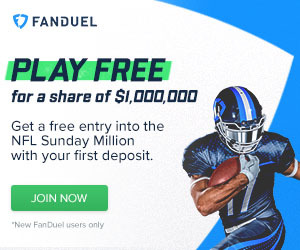 For the dozen teams that are still alive and fighting for that ultimate goal, the fun is just beginning and, if you're planning on taking part in any daily fantasy football contests during the playoffs, the fun continues for you as well. As usual, we'll be keeping you up to speed with all of the latest injury news ahead of the big games. Saturday- Kansas City @ Houston 3:35 p.m.; Pittsburgh @ Cincinnati 7:15 p.m.
Sunday- Seattle @ Minnesota 12 p.m.; Green Bay @ Washington 3 p.m. The wildcard round gets underway on Saturday afternoon and wraps up Sunday evening. 8 teams will be vying for 4 spots in the divisional round with places in the conference championship games on the line as the Super Bowl draws closer and closer. Here is your playoff injury report for the wildcard round. - Bengals QB Andy Dalton's status for Saturday night's wildcard matchup with Pittsburgh remains in limbo at the moment. Dalton, who has missed the last 3 weeks with a thumb injury, is due to meet with a specialist in Florida today. Dalton is hoping to shed the cast he has sported since the injury, though he could still be sidelined on a week-to-week basis. If Dalton can not get clearance to play on Saturday night, A.J. McCarron will continue to handle the duties under center for Cincinnati. Keith Wenning would continue to backup McCarron. - Steelers RB DeAngelo Williams is due to undergo an MRI on his ankle injury today. Wiliams was injured early in his team's must-win week 17 game against Cleveland. He did not return to the game and was spotted in a walking boot afterwards. Williams, who has a history of lower-body ailments, has been filling in admirably for Le'Veon Bell (knee). If Williams is sidelined, Fitzgerald Toussaint and Jordan Todman would see plenty of work against the Bengals on Saturday night. It's possible that Williams could be considered day-to-day for the time being. - Texans WR Cecil Shorts III says he will be able to play against Kansas City on Saturday afternoon after missing the team's last 2 regular season games with a hamstring injury. Shorts, who has a lengthy history of soft-tissue ailments, spoke to reporters after Houston's win over his former club Jacksonville. "Now, it’s go-time," Shorts said. "Now, it’s a whole new season. The slates are clean. Everything is 0-0. Gotta get it going." Fellow wideout Nate Washington left the win over the Jaguars with a hip injury and did not return to the game. Washington, who has already battled a hip ailment earlier this season, will receive treatment through the week. It's possible that Houston elected to rest the 32-year-old with the game well in-hand at the time of his injury. QB Brian Hoyer is back after returning from a concussion in week 17. 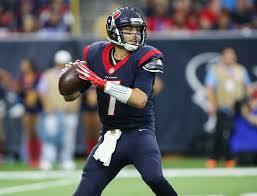 Brian Hoyer is ready to rock for the wildcard round after returning from a concussion in week 17. - Chiefs scatback De'Anthony Thomas has been placed on the NFI (non-football injury) list and will miss the playoffs. Thomas had been dealing with a concussion but was able to practice before landing on the NFI list. Thomas had not played since week 11, so it's possible that his concussion symptoms resurfaced upon his return to the practice field. That said, it's strange to see him placed on the NFI list as opposed to IR. - Vikings TE Rhett Ellison suffered a serious knee injury during his team's week 17 win at Green Bay. Ellison tore the patellar tendon in his kneee and will miss the playoffs. Ellison, a soon-to-be free agent, will also be racing against time in order to be fit for the start of 2016. An excellent run blocker, Ellison's absence will likely have a negative impact the Vikes' run game. MyCole Pruitt should see extra snaps behind Kyle Rudolph. - Seahawks TE Luke Willson missed his team's week 17 win over Arizona as he continues his recovery from a concussion sustained in week 16. Cooper Helfet and Chase Coffman -- who scored in week 17-- played in his absence. The team is already without Jimmy Graham (knee) for the rest of the season. Meanwhile, RB Marshawn Lynch, who has not played since week 10 after undergoing abdominal surgery, is hoping to play against Washington on Sunday. Lynch is expected to rejoin the Seahawks on Monday after spending the last few weeks rehabbing away from the team. If Lynch were to be ruled out for the wildcard round, Fred Jackson, Christine Michael, and Bryce Brown will continue to form a committee. Thomas Rawls (ankle) is out for the season after going down in week 15. - Redskins wideout DeSean Jackson should be available for Sunday's game with Seattle after the team elected to rest him in their week 17 win at Dallas. Jackson, who was active for the game but did not play a single snap, had been bothered by a minor knee injury. After missing several games at the beginning of the year with a hamstring injury, it was a wise move on Washington's part to rest D-Jax ahead of the Seahawks' visit. RB Matt Jones (hip) missed his second-straight game, but is expected to be ready in time to face Seattle.